In November of 2016, Street Plans worked with the City of Fayetteville as one of six “Beta City” partners associated with the Tactical Urbanist’s Guide to Materials and Design. During the workshop, Street Plans and various City partners built a one-hour demonstration project and developed ideas for a pilot project for West Spring Street. As a result of the workshop, the City installed a mini-roundabout on Spring Street for one month, from February to March of 2017. 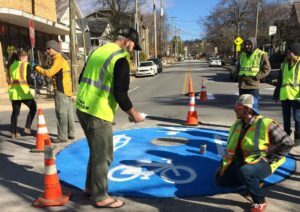 The City of Fayetteville has since announced they are “investigating the process of creating a permit which would allow community groups and neighborhoods to initiate Tactical Urbanism projects and installations.” The city plans to create a process similar to the Tactical Urbanism policy that Street Plans developed with Burlington, Vermont. Click here for more information.